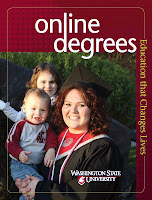 “Education that Changes Lives,” says the tagline on the new Distance Degree Programs brochure. For the woman on the cover, the words were prescient. The photo of Melanie Bott, with her children, Kaycee, 4, and Kayden, 1, was taken during spring 2009 graduation. Melanie earned her human development degree through DDP at the same time her husband, Isaac, graduated from WSU’s Veterinary Medicine Program. Now it’s Melanie’s turn to change lives. “I will be going into the homes of the low income, poverty stricken, homeless – the neediest of needy – teaching parents how to teach their children,” she said. Melanie’s family is happy about the job – and excited that she’s on the DDP brochure. Summer 2010 Internship Opportunity in D.C.